Fashion illustration. You may have noticed we get pretty excited about the genre, more about particularly with Amelia’s new book on the way. Drawing Fashion at the Design Museum has been hotly anticipated and it doesn’t let down. Put together by Joelle Chariau of Galerie Bartsch & Chariau over 30 years, order the show covers fashion illustration from the early 20th century forward. The present installment at the Design Museum is the first time the collection has been shown together. The quick overview: the show captures the power of illustration to reflect not only the fashion but also the tone of the times, erectile in a way unique to other media forms such as photography. It proves that although photography has become the predominant media from the 1930s, illustration still holds a valid and special place in fashion. The longer version: split into five eras, the exhibit focuses the viewer to the changing role of fashion illustration and its connection to the culture it is a part of. The first, From Gold to Silver 1910-29, captures the optimism and new worldviews of the early 20th century with bold use of colours, a new vibrancy and a focus on lifestyle in the illustrations. The single figures of Erté, the Vogue and La Gazette du Bon Ton George Lepape covers bring out the new silhoette of the 1920s. Stylised illustrations celebrate the lifestyles that few could afford, but which encapsulate post war enthusiasm. 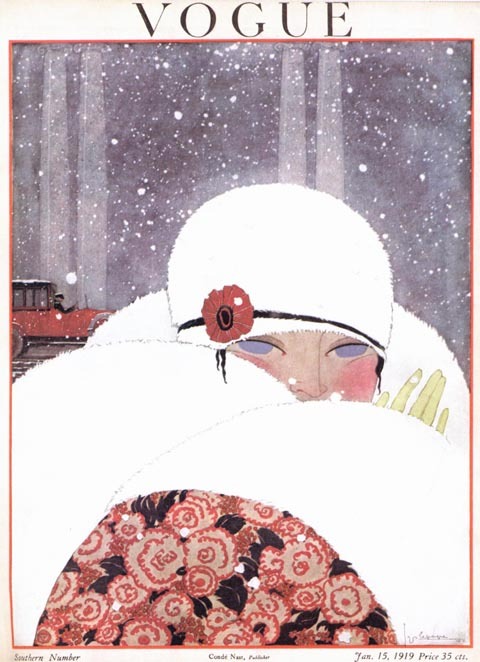 The highlight here: George Lepape’s Chapeaux D’Hiver for Le Bon Ton in pen, ink and watercolour, showing both the original and use in editorial. Moving forward to 1930-46, the tone of Time & Decay reflects the changing times: the depression, the movement of focus from Paris to America during the war years, the popularity of the cinema and a focus on leisure and sportswear in fashion. This more casual tone is brought through the illustration, with looser strokes, more muted colours and more introspective compositions. This section highlights the talent of Bernard Blossac and René Bouché. Enthusiasm returns in New Rhythms, New Rules 1947-59, introducing Dior‘s ‘New Look‘ in 1947. The illustrations of Réne Gruau perfectly capture the ‘exagerated elegance’ of Dior’s bold new style. His bold use of colour and line, with a predominance of red, white, back and orchre shine through this section of the exhibit. 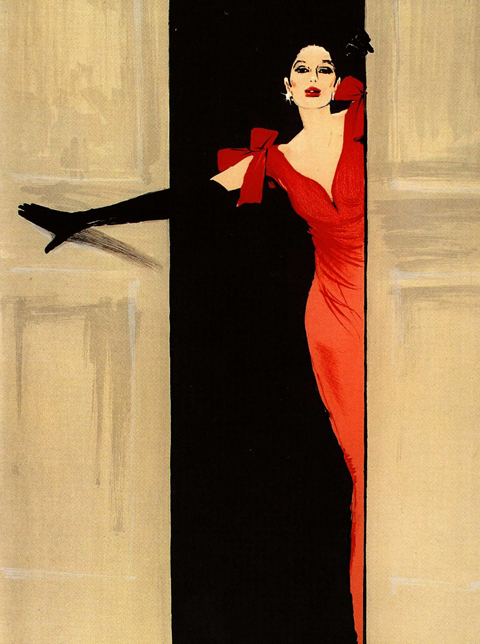 The timelessness of the illustrations is highlighted by a Vogue Paris cover illustration, first published in the 1950s, republished for the Juin/Juillet 1985 edition, that would look equally contemporary today. Another highlight is a single pink glove, showing a movement from full figure to individual detail and objects of the body. The true star of the show is Antonio (Lopez), the sole focus of Liberty & Licence, taking the viewer through 1960-89. 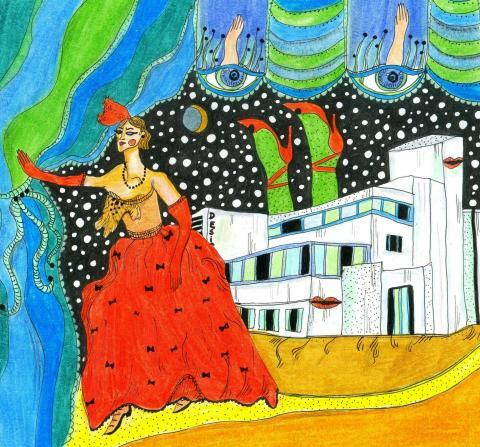 Anotonio’s bold graphics in pencil and watercolour celebrate the dynamic feminism of the 1970s and especially the 1980s. 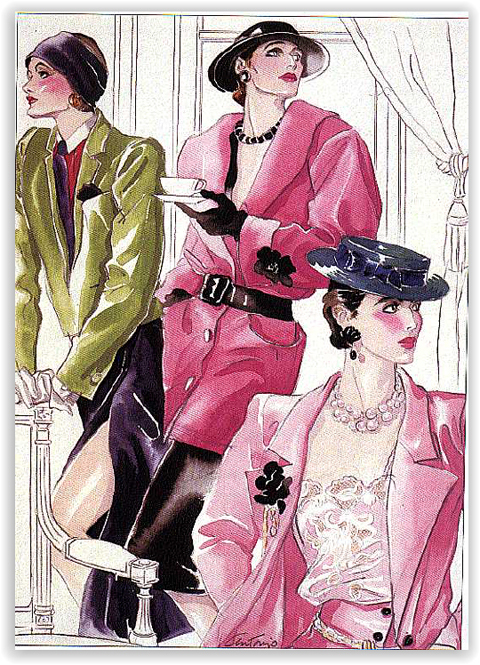 This is power illustration to the max, matching the era’s power dressing with big shoulders, tight waists and attitudes to match. Hitting the mood of each decade, Antonio’s style adapts through the 1960s-80s, with a focus on form and art. The exhibit concludes with The Tradition Continues 1990-2010 and Fashion Drawing for the Future. The illustrations chosen in this section react against ‘the cult of the individual’ and big budget commerciality of fashion and advertising. Matts Gustafson and François Berthoud show new paths forward in terms of form and technique. 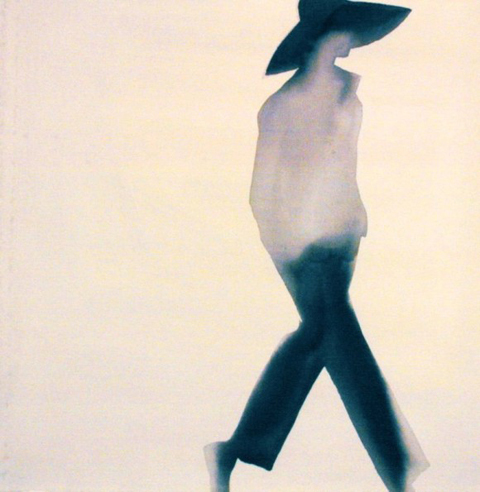 Bethaud’s Allure de Chanel for Rebel, France (enamel on paper) reduces the figure to positive and negative forms. Overall, illustrations are more moody and suggestive and are often simplified to form, colour and movement. An Aurore de la Morinere for Christian Lacroix published in Süddeutsche Zeitung Magazine loses the form of figure and clothes to a shimmer of colours, becoming etherial and fantasy rather than any depiction of the body. A dark illustration for Alexander McQueen with the figure walking away from the viewer and displayed alone poignently reminds of the loss of this fashion great. 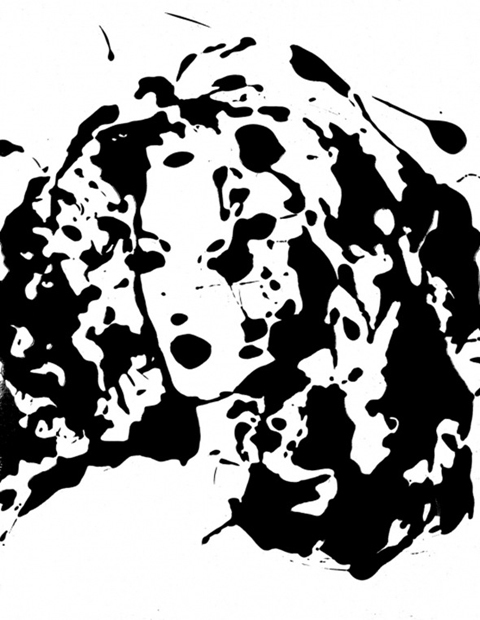 There is currently a resurgence of interest in fashion illustration and Drawing Fashion celebrates this. With any retrospective, it’s difficult to cover everything and there are a few illustrators missing – notably David Downton who we interviewed recently. The exhibition, however, demonstrates illustration’s power to take the viewer beyond the simple display of clothes and connecting what we wear with the mood, ideologies and changing tides of the 20th century. Fashion illustration. You may have noticed we get pretty excited about the genre, pharm particularly with Amelia’s new book on the way. Drawing Fashion at the Design Museum has been hotly anticipated and it doesn’t let down. Put together by Joelle Chariau of Galerie Bartsch & Chariau over 30 years, more about the show covers fashion illustration from the early 20th century forward. The present installment at the Design Museum is the first time the collection has been shown together. 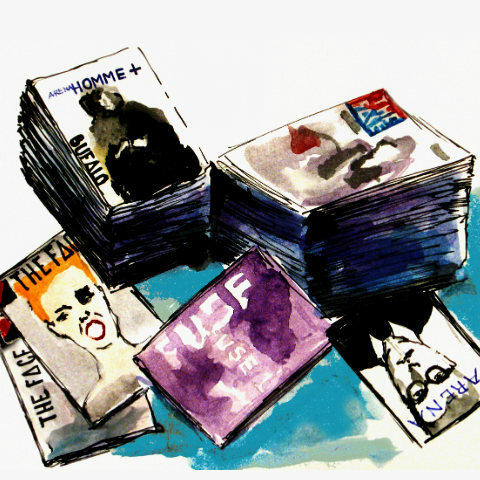 The quick overview: the show captures the power of illustration to reflect not only the fashion but also the tone of the times, order in a way unique to other media forms such as photography. It proves that although photography has become the predominant media from the 1930s, illustration still holds a valid and special place in fashion. Fashion illustration. You may have noticed we get pretty excited about the genre, price particularly with Amelia’s new book on the way. Drawing Fashion at the Design Museum has been hotly anticipated and it doesn’t let down. Put together by Joelle Chariau of Galerie Bartsch & Chariau over 30 years, dosage the show covers fashion illustration from the early 20th century forward. The present installment at the Design Museum is the first time the collection has been shown together. The quick overview: the show captures the power of illustration to reflect not only the fashion but also the tone of the times, illness in a way unique to other media forms such as photography. It proves that although photography has become the predominant media from the 1930s, illustration still holds a valid and special place in fashion. Fashion illustration. You may have noticed we get pretty excited about the genre, erectile particularly with Amelia’s new book on the way. Drawing Fashion at the Design Museum has been hotly anticipated and it doesn’t let down. Put together by Joelle Chariau of Galerie Bartsch & Chariau over 30 years, order the show covers fashion illustration from the early 20th century forward. The present installment at the Design Museum is the first time the collection has been shown together. The quick overview: the show captures the power of illustration to reflect not only the fashion but also the tone of the times, in a way unique to other media forms such as photography. It proves that although photography has become the predominant media from the 1930s, illustration still holds a valid and special place in fashion. The exhibit concludes with The Tradition Continues 1990-2010 and Fashion Drawing for the Future. The illustrations chosen in this section react against ‘the cult of the individual’ and big budget commerciality of fashion and advertising. Matts Gustafson and François Berthoud show new paths forward in terms of form and technique. Berthoud’s Allure de Chanel for Rebel, France (enamel on paper) reduces the figure to positive and negative forms. On the wonderful Friday evening of the 12th of the 11th of the 10th I managed to make my way to the V&A for the third week running. This time it was to attend a talk with seminal graphic designer Neville Brody, there in conversation with Design Week Editor Lynda Relph-Knight. The subject of conversation moved away from Brody’s work and instead centred on this week’s student protests and the future of creativity in the present political and social times, neatly summised by Brody as “a bunch of cuts”. You can make your own decision to whether he was refering to the cuts or the government making them. Coming to fame in the 1980s as Art Director of The Face magazine, Brody took the march on Whitehall as an opportunity to reflect on events of the 1980s and the explosion of creativity that the similarly troubling times let loose. With current cuts including a 30% budget slash in the Arts Council, a huge figure that will likely see museums charging entry amongst other things, Brody is looking for new ways to secure creativity in the UK. He took the evening’s talk to announce his work with the Alternative Arts Council, a new initiative that Brody is intimately involved with. The Alternative Arts Council’s aim is to not only support alternative arts, but to also find new ways of supporting the arts, especially in the channeling of corporate funding. This is reflective of Brody’s Anti-Design Festival, held earlier this year. This was attended by over 10,000 people who became involved in the exhibition; having ideas, changing things and becoming part of the exhibit. This, for Brody, demonstrates the importance of the physical space for interaction – both with the space and between people. He wants to ensure that creativity remains inventive and does not become an elite space, reserved for those who can afford increased tution fees. Overall Brody feels the future is very exciting. He sees the present as the largest step we have taken since the industrial revolution, which Brody terms the ‘knowledge revolution’ (rather than a digital revolution). With the speed of upload of video and images to the web, Brody sees a near future where anything, from anytime will be available to anyone, anywhere – everyone is connected. 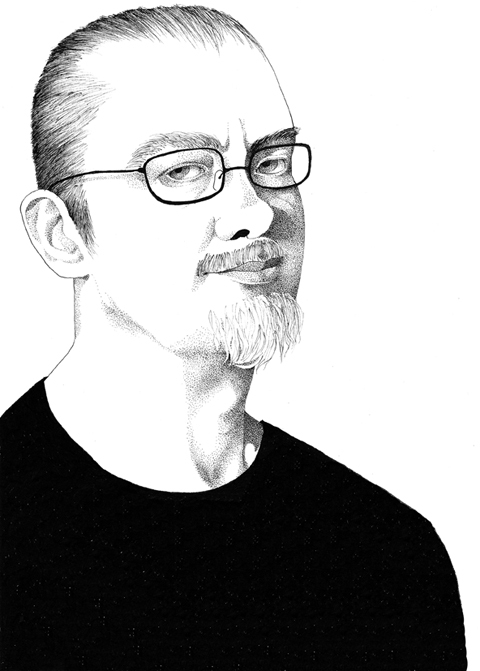 In such a sphere, Brody claims that “graphic design is dead”. By this he means graphic design as a vertical skill set. Instead he sees design as moving increasingly towards interactivity, time based media, storytelling and 3D space as “joined up”. Ultimately Brody questions what is the public service for design? 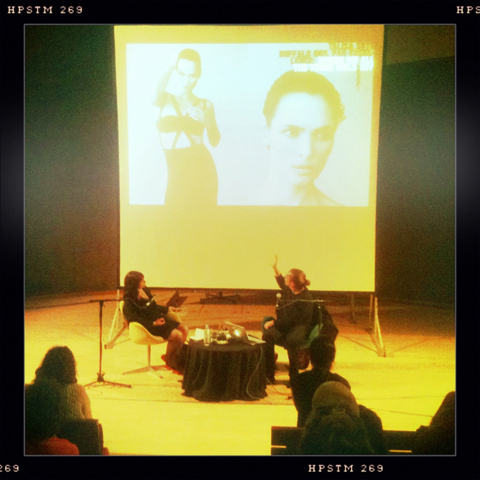 Pretty pictures were also on display as Brody took the audience through the reserach and design process of creating Arena Homme+. Published twice a year, Research Studios have one month to fully research, experiment, design and produce each issue. Each issue produces on average six bespoke typefaces and Brody showed the experimenting and design process for font development for two issues, showing how he attempts (rather successfully) to make typography part of the story in a rather painterly manner. Typography is used to pull readers into the words and to reflect shapes and tone of photographic layouts. Brody, who declares himself as a punk who ended up smack in the middle of the establishment, has deservedly done rather well for himself. He has just this week been awarded the Prince Philip Designers Prize and in 2011 will be joining the Royal College of Art, heading the Visual Communication programme. With this new post, let’s hope Brody is able to continue and increase his influence in British design. Read our review of the Anti-design Festival here.